Recently I was given the opportunity to preview an upcoming new game. I received a prototype copy of the game and rules. These are my thoughts and opinions on the presented materials. Enjoy! 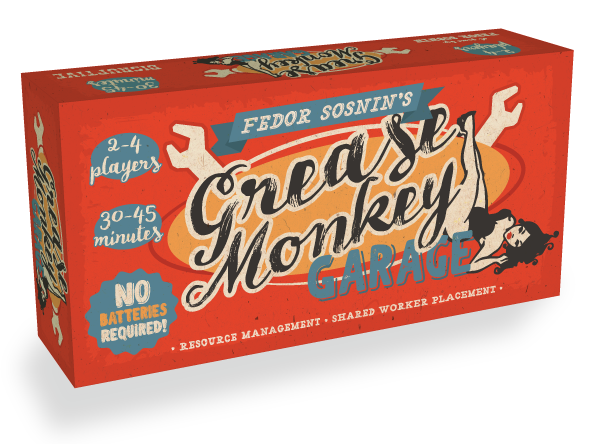 Grease Monkey Garage is a game by Fedor Sosnin, published by Disruptive Inc.. It is for 2-4 players. In this game, players take on the role of shift managers at a local auto shop. They’ll be managing the mechanics and the shops resources, as well as their time while the owner is on a 2 week vacation. They’ll need to fix customer’s vehicles while storing spare parts in their personal stash for quick access if they hope to earn a better reputation than their opponents. In the end, the player with the highest reputation will be declared the winner. To begin, the shop cards are laid out to create a 4 x 2 grid. Each card is placed in numerical order based on the difficulty level chosen using the numbers on the bottom of each card. The calendar card and score card are placed side by side above the shop cards. The calendar token is placed on the calendar card on the first space. The vehicle cards are shuffled together and placed face down to the side of the shop cards. A number of vehicle cards are then drawn and placed in a face up row below the deck equal to the number of players plus 1. A certain amount of resource tokens are placed beside the corresponding shop card. For more information on the amount, please check the rulebook. Players choose a color and receive the corresponding colored stach card and 3 specialists. The specialists are placed on the designated spot of the stash card. Each player then takes 2 reputaion markers in their color which are placed on the two 0 spaces on the reputation card. A mechanic is placed on the 4 shop cards in the corners of the grid. The Employee of the Month card is set aside for now but will be used at the end of the game. The first player is chosen and they are given the first player card. Play now begins. The game is played over a series of 10 rounds. For 2 player games, it is played over 12 rounds. Each round players take their turn in beginning with the first player and continuing in clockwise order. On a player’s turn, they will move each of the 4 mechanics, one at a time. The mechanics must be moved to an adjacent card but may not be moved diagonally. The player then takes the corresponding action that the card provides, if possible. Once the mechanic has been moved, the player lays it down to show that it’s already been moved during their turn. If a player has any specialists active, they may also be moved during the player’s turn and the card action taken. Just like the mechanics, once they’re moved, they are also laid down. Once the player has moved all the mechanics and any of their available specialists that they would like to move, their turn is over. The player then stands all the mechanics and any of their moved specialists back up. Play then passes to the next player who follows the same procedure. At the end of each round, the calendar token is advanced by 1 space. Now let me explain what each of the different shop cards do. As mentioned earlier, each of these provides a different action. Four of these actions provide the player with resources. The Oil provides 1 oil resource. The Parts provide 2 parts resources. The Tires provide 2 tire resources. The Tools provide 1 tool resource. Each time a resource is gained, it’s placed on the player’s stash card. If there are no more of the resource available in the supply, the player may then take it from another player’s stash. The other 4 are a bit more complicated. First off there’s the Checklist. 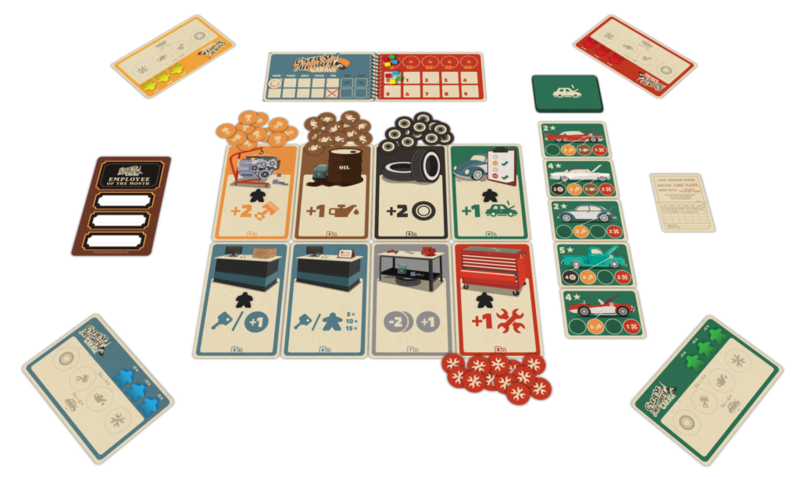 This allows the player to take one of the vehicles from the face up row of cards and place it below their stash card. A new card is then drawn from the deck to refill the row with. Each player may only have 1 vehicle that they’re working on at a time, unless they have hired a specialist. They are then allowed 1 extra vehicle for each hired specialist that they have. The Front Desk allows the player to return a vehicle or they may gain a resource of their choice. We’ll discuss returning a vehicle in more detail in a moment. The Shop Office allows the player to return a vehicle or they may hire a specialist. If they choose to hire a specialist, the specialist is laid down on the Shop Office and can not be moved until the player’s next turn. It should be noted that players are not allowed to hire a specialist until they’ve reached a certain reputation. For the first specialist, that number is 5. The second specialist requires 10 reputation and the third one requires 15. The Workbench allows the player to pay any 2 resources to gain a resource of their choice. Earlier I mentioned that certain cards allow the player to return a vehicle. Returning a vehicle is the main way that reputation points are earned, or lost in some instances. To gain reputation, the player needs to pay the required resources printed on the vehicle that they’re working on to repair it. If they’re able to pay the type and amount of each, returning them to the supply, then they gain the number of reputation points printed on the card. The vehicle card is then placed in the discard pile. The player can also choose to return a vehicle without repairing it. This means that they don’t pay the resources to fix it. The card is simply placed in the discard pile. However, the player must lost 1 reputation point because of this. The game continues until the calendar token reaches the space marked with the red X on it. At this point, the game ends and scoring occurs. The game can also end if the last vehicle is taken during a round. If this occurs, the current round is finished and then the game ends. Once the game ends, players earn bonuses to their reputation. They earn points for each specialist that they’ve hired and for every 3 resources left in their stash. They can also lose points for each vehicle they have not returned. Players add up their reputation and the one with the highest total reputation is the winner. They are the Employee of the Month and get to write their name on the Employee of the Month card. As this is only a prototype, I won’t go into too much detail here, as things are likely to change. From what I’ve seen so far though, everything looks to be going in the right direction. There are stash cards which are the player mats for each player, as well as the calendar card and reputation card. I like the designs for these. They’re very efficient and work really well with the game. I also like the artistic look of them too. There are the different shop cards and the employee of the month card too. I really like the shop cards. I don’t think the iconography is difficult to understand and the art looks really great. The same can be said for the vehicle cards and the various resource tokens. The reference cards are really great and are very helpful. The meeples and cubes are all wood and brightly colored. Nothing spectacular about these but they work. Of course I hope that if this game goes to Kickstarter, the meeples will be upgraded with some heat printed designs for specialists and mechanics or maybe some stickers if nothing else. I think that would put it over the top for me. As it is now, it’s really good and I like it a lot. I really think that this will be another really nice looking game. Like the components, the rules are also a prototype. There are lots of great pictures and examples throughout the book. There is even a great picture of how the game should look once it’s set up. Each of the different shop cards are explained in really great detail. The rules are all well written and are easy to read. The book is fairly short so it won’t take a long time to get through either. Overall, it looks really nice and covers everything quite well. I didn’t see anything that was difficult to understand at all. I’m sure there will most likely be some revisions to the rules, but for now they look great. This is a really fun game. It has some of the aspects of a worker placement game to it, but you’re not actually placing workers on the board. Instead you’re moving the workers around on the different shop cards to have them do different actions. Of course, that will then affect what the next player can do on their turn and so on. I really find myself liking how that works. It sort of reminds me of Little Circuses. However, I like this a lot better as you have more pieces to move around and collect resources with or perform actions with. I like that as you move up in your reputation, you can add more specialists which then make it possible to work on more cards. Of course you have to be careful that you don’t have too much going on at one time as the game can end and you’re stuck with vehicles that aren’t repaired to count against you. I really like games that give you that risk vs reward factor like this one does. I also like it when a game penalizes you for stretching yourself too far. This one really highlights a lot of things that I like in a game. Fans of games like Little Circuses or Mint Works will most likely like this game. It’s a really light and fun game that the whole family can enjoy. I highly recommend it. It’s really quite good. Grease Monkey Garage is a light weight worker placement game that the whole family can enjoy. It’s not a really long game. Most game sessions last around 45 minutes or so. The artwork throughout the game is really nice and simplistic but still light and fun. My only hope is that if the game goes to Kickstarter that heat printed meeples or stickers for the meeples will be part of the stretch goals to help the overall look of the game. The game itself is really fun and simple. I really enjoy the worker placement style mechanics in this one. It reminds me a lot of Little Circuses. Fans of games like Little Circuses and Mint Works should really enjoy this one. I really enjoy the game and think that this one is definitely headed in the right direction. It’s a great family game that everyone can enjoy. I highly recommend it. It’s Shoptastic. For more information about this and other great games, please check out Disruptive Inc. at their site. Keep an eye out for the upcoming Kickstarter campaign as well. This entry was posted in Preview Reviews and tagged board, board games, card, card games, disruptive, disruptive inc, fedor, fedor sosnin, games, garage, grease, grease monkey, grease monkey garage, monkey, sosnin. Bookmark the permalink.